As a teacher I am always looking for new ways to challenge my students and effectively assess their understanding of the concepts that I teach them. Additionally, I want to teach my students to be critical thinkers and be able to analyze and interpret data and information. This is a skill that goes beyond any content area is beneficial to all aspects of life. 1. In introductory paragraph containing information about an experiment or scientific principal. 2. A series of 2-4 graphs, tables, or charts. 3. 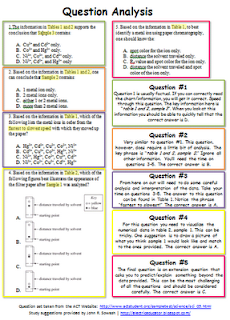 A collection of 4-7 multiple choice questions related to the provided information. There are seven sample question sets posted on the ACT website. It's worth taking a look at them to understand their structure. I tell my students that they don't need to know anything about the subject of the questions in order to answer the questions correctly because the answers are "hidden" in the information that is provided. It's their job to find these answers. An interesting exercise to prove this to your students it to give them a set of problems for a course they haven't taken and see how they do. The won't get all of the questions, but they will get some of them! 1. Ignore all of the information, charts and graphs. Go straight to the first question. Typically this will be a general "what are we talking about" type of question in which you will be asked to identify the purpose of the experiment or study. Usually this information can be found within the introductory information or the titles of the data sets. While you don't want to rush, it is important to work through this question quickly because you will need extra time on the final question. 2. Ignore all other information and focus on the table/graph/chart that is referenced in the question. Questions 2-3 will usually contain a phrase such as "look at table 4" or "according to the graph". This is your clue that the answer to this question can be found in this data set. These questions are typically pretty easy. All you need to do is correctly interpret the data that is provided. Again, while you don't want to rush, it is important to work through these questions quickly because you will need extra time on the final question. 3. Work backwards on analysis questions. Question 4 (sometimes question 3-4) will be similar in construction to question 2 however this time you will be asked to compare, contrast, interpret, or order the results of two or more charts, graphs, or tables. There will typically be a key phrase such as "according to tables 2 and 3", "compare the test results of trials 1 and 2," or "arrange the test results of experiment 1 from largest to smallest." Do some quick mental math and choose an approximate value/answer for the question. Next, look at the available choices to see if there is a value/answer close to your approximation. Work backwards to determine if the value is a reasonable choice. If none of the answers are close to your guess, re-calculate your guess or re-read the information to ensure that you didn't make an error or miss an important piece of information. One of the common mistakes that student make on these question is missing important directions such as smallest to largest, fastest to slowest, etc. If your guess was way off, look for such a phrase and make sure you interpreted the data correctly. 4. Make a prediction! The final question (s) is/are the most challenging and will take the longest. In these questions you are asked to make a prediction. These questions can be tricky because the require you to use multiple pieces of information to draw a conclusion beyond the scope of the provided data/information. If your understanding of any of one portion of the data/information is incorrect, your final conclusion will also be flawed. In questions based on an experiment, you might be asked what would happen if one of the experimental variables is changed. In questions based on collected data, you might be asked to extrapolate the data beyond the range that is provided. Pay careful attention to units, time, and be sure to double check your calculations (most of the time you will be doing basic math). Practice is essential if students are to master information analysis. Every test that I give has an "ACT question" on it. These question sets are a ton of work to put together but they require students to work with information in complex and challenging ways. Am I teaching to the ACT test? Well, kind of, but believe that the data analysis skills I am teaching my students will benefit them well beyond the ACT test. I am trying to train critical thinkers and problem solvers, not just students who can fill in the right bubble with a #2 pencil. Frequently the ACT problem sets that I give cause discussion amongst the students as they talk with one another to figure out the correct answers. Each of them has some "logical" reason for their choice and in talking to one another they frequently find errors in their own assumptions and calculations. While my students don't particularly enjoy these problem sets, at the end of the year several of them told me that they thought they were valuable exercises. If you'd like to challenge your students with similar problem sets feel free to use the handout I created with a sample question from the ACT website. I'd be interested in hearing if you think these types of questions could be used in other disciplines in addition to science. To challenge your students and make them think, realize that science is based upon fundamental principles and logic. Teachers must understand how students think and build from there using the principles. Then question them and let them work on the board, making sure they use the principles, not just starting from where they think the teacher said. See "Teaching and Helping Students Think and Do Better" on amazon. I have just satrting teaching ACT science prep. it is very challenging because my students doent want to work on it.i try to make them solve problems first than we are working on them after they are done with solving problems. do you have any other ideas to make this class much more interesting. and also which documents do you usually use, do you mind sharing them. Hello, Anonymous. It is critical that you focus on explaining WHY the ACT challenge questions are so important, trying to intrinsically motivate the students. I usually introduce them with a challenge-- acting like I don't thing they can do it, but they can try if they think they might be able to do it. If they get 4/5 correct, I give them some kind of simple reward (candy/gum). Over time the ACT challenge questions become a regular part of class. Most of the problem sets that I use I have taken from ACT/SAT/PSAT test books. If you pick up a couple of test prep books from the library/book store you'll have lots of material to use. I have created some questions sets from scratch on my own. It is very time consuming and challenging. I would stick to that which has been done as much as you can. I would be happy to share some of the questions I have created, but they are all related to Biology. Send me an email: jsowash [at] southfieldchristian [dot] org.